I can't believe I'm still here in Virginia working on this hardtop project. I knew I was being optimistic with the original theory on how long it would take, but we are over 3 times that now. And it is taking a bit of a mental toll on us. Hayes, Virginia, has lost its appeal and we really, really want to be moving on. We know that this will be one of the best additions to the boat in the long run, but we need to get this thing done. One of the largest issues seems to be the weather. 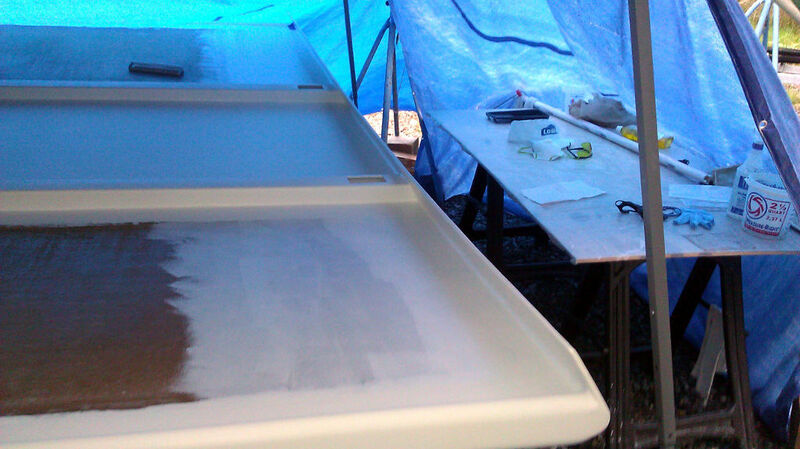 When we started the project, temperatures were so high that we couldn't lay up fiberglass until late in the evening. Now the temperatures barely make it up to the recommended 60 to 65 degree (Fahrenheit) minimum needed for polyester resin and gelcoat to cure. Of course being outside, rain has also been an issue. You can't get uncured or curing resin wet, and laminating resin doesn't like to be wet even after it cures since the surface is still tacky. Shielding our work from the elements has been a challenge. Right now I'm waiting for some rain to blow over so we can hopefully apply more gelcoat later today. Weather hasn't been the only issue, though. As I've admitted before, I'm a bit of a perfectionist. This doesn't really work well when working in 3rd world conditions in a boatyard. Don't get me wrong, I think the top is coming out very well, but my engineering mind sees the minor issues and wants to fix them. Some of the imperfections have caused issues and taken a lot of time as well. Still have a little gelcoat to apply to the underside before we flip it. The handrails, particularly along the front edge of the top, are not perfectly straight and/or nice uniform curves. The minor variances mean that when trying to smooth the gelcoat (we want the handrail detail to look good and feel good when you are holding onto it), it is very easy to sand through the coating. Gelcoat requires a thick layer to look good, and if it gets thin (what would be considered a thick layer in terms of regular paint) it becomes translucent. As a result, we've applied gelcoat, sanded it down, and repeated this process until there are only a couple thin spots left. At this point I think we can touch up the thin spots and be good to go. But it has taken a lot of time to get to this point. In hindsight, we probably should have just kept the minor orange peel texture that the paint roller created...oh well. 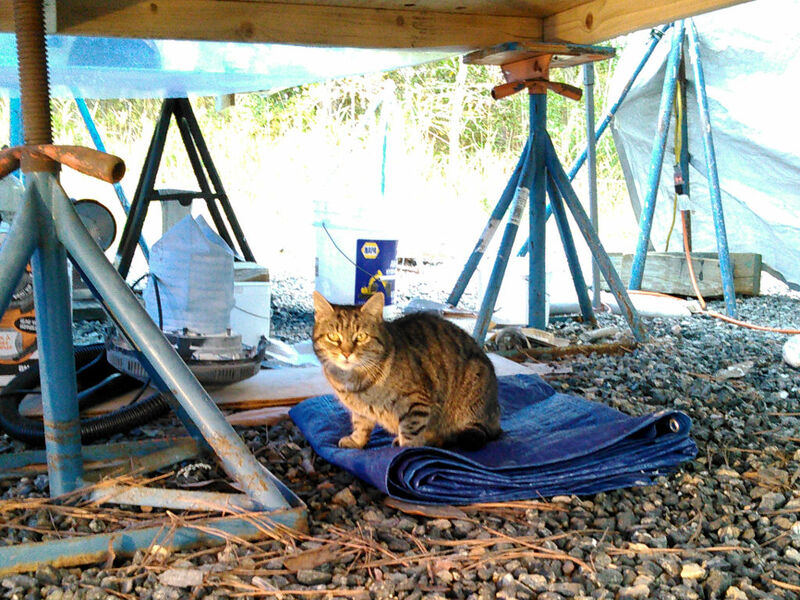 We've been here so long, that even one of the stray cats that hangs out in the boatyard has decided to adopt me. Or maybe she just likes the shelter from the rain that three roofs (the canopy, the hardtop, and the table) provide. Boatyard stray cat that seems to like us. So, what does this have to do with the title of this post...well, I'm getting to that. As a perfectionist, I've always had a problem with the concept of perfect being the enemy of good. One of the reasons I became somewhat dissatisfied with my career was that I wanted to do good work and most companies just wanted fast (let the customers find the bugs) and didn't care much about good. I became more forgiving with software but still refused to put out a bad product. With something visual like this hardtop, I'm still battling with the idea of "good enough". The "Paint it yellow" story came from a coworker a number of years ago. My memory isn't perfect, so this may not be accurate, but this is how I recall the story going. My coworker was working for a large software house. As such large companies like to do from time to time, they do somewhat cheesy things to try to boost morale or motivate employees. This company had a "caption this poster" contest where they had a number of poster images and asked employees to come up with motivational captions. Among the posters was a picture of a bunch of yellow chicks with one albino chick in the mix. I'm sure that the company was looking for something like "stand out in a crowd" or "don't be afraid to be different". One of the employees, apparently having worked in the industry long enough, had what was a more appropriate caption for the poster. His entry was "Screw it. Paint it yellow and ship it". A short time later, the contest was cancelled and the posters were taken down. But, for a perfectionist, this is an important lesson. While it is admirable to always want your work to be the best, sometimes you just need to realize there is a point where it is "good enough". I'm sure the top is better than good enough, now I just need to convince myself of that and get this thing done and on the boat. But first, I guess I need to convince mother nature to stop spitting water at me. The plan has never been to add the solar here, I just look into the next steps when there are down times such as waiting for the weather. If there was a next step to do here, it would be the front dodger anyway...a much more immediate priority given the cold. But that won't happen until later. Good thoughts on perfectionism - I bet what you think is "good enough" actually looks pretty darn perfect to everyone else. Well, the cat may be ready to join the crew...but our crew (the two furry, four legged ones) may have other thoughts about her. Still, I almost expect to find the cat sitting in the cockpit of our boat sometime soon. And, yeah, my usual good enough is probably close to perfect anyway...but my "paint it yellow" option is less. Still, it is the underside and if it ends up bugging me that much, I guess I can decide to fix it later (the lazy part of me will no doubt veto this option). I feel for you I have the same "issue" with being a perfectionist, to the point that it can be disabling at times. But, all the problems that we see in our projects 99% of the population won't even know exist. But the other side of the coin is..... if every time you look at it something jumps out at you and drives you crazy then fix it now. It's always (imho) better and cheaper to do something right the first time then to have to go back and do it again. It's looking good from the pictures and will all be worth it in the end. Actually, this thing won't be painted to match. We decided to forego the color match and went with straight white. The minor things probably won't bother me once they are done and on the boat, but when they are on the shop table and I can fix it...I usually want to. The truth is, the top probably looks better now than the boat does. Being an ex charter boat, it has a lot of nicks and dings that have been patched and others that have not. And the patches are different shades of gelcoat anywhere from just a little off to straight white (we once joked about naming the boat calico). As for cheaper...sanding off $75/gallon gelcoat can get pretty pricey. ;-) In the end I'm sure it will be better than good enough (a few people that have come looked at it already called me a perfectionist...just reminds me to stop it)..